Voluntary methane emission targets best strategy for American oil and gas? The American energy industry is ignoring a potent political push back in its battle with the Obama Administration over methane emission regulations : Committing to doing the job better and faster voluntarily than cumbersome regulation could ever achieve. Fractured Gas Well Completions and Workovers Estimate, EPA. On Tuesday, the Administration announced a new goal to cut methane emissions from the oil and gas sector by 40 – 45 per cent from 2012 levels by 2025. 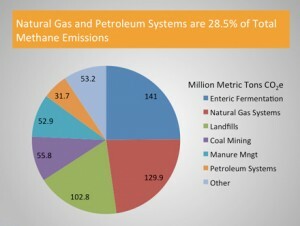 It plans to build on standards introduced in 2012 by the Environmental Protection Agency to decrease methane emissions in an amount equivalent to 33 million tons of carbon per year. The EPA will issue a proposed rule in the summer of 2015 and a final rule in 2016. Not surprisingly, industry wasn’t happy. The American Petroleum Institute argued that voluntarily actions had reduced emissions from hydraulic fracturing by 73 per cent since 2005, according to the EPA’s own data. 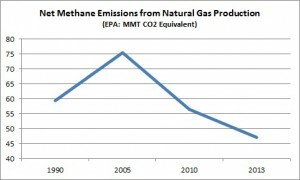 Total methane emissions from natural gas systems are down 11 percent during that period. “The latest inventory shows that U.S. producers continue to make dramatic improvements, with net methane emissions from natural gas production falling 38 percent since 2005,” said Howard J. Feldman, API senior director of regulatory and scientific affairs. One, the American oil and gas sector is developing and implementing new technologies to capture fugitive methane and turn it into a revenue-generating product. Two, the industry has already enjoyed considerable success over the past four or five years. Three, it argues for being allowed to continue to lower methane emissions voluntarily. Four, it also recognizes the considerable political pressure from the American public and from the Obama Administration to do more. Then why not get out in front of the Administration and the activist EPA and voluntarily commit to achievable methane reduction targets? And the Administration raised the possibility that regulation – or more onerous regulation – could be avoided if industry steps up to the plate. “Voluntary efforts to reduce emissions in a comprehensive and transparent manner hold the potential to realize significant reductions in a quick, flexible, cost-effective way,” the Whitehouse press secretary said in a press release. The final EPA rule on achieving Administration reduction targets doesn’t take effect for a year. Why not take that time and organize producers and service companies around a strategy that serves both public and industry interests? The alternative is to always be reacting to the federal government’s regulatory initiatives and sniping from the sidelines while the EPA implements regulations industry doesn’t like. What’s the worst that could happen? The EPA goes ahead with regulations regardless of industry input – always a strong possibility – and industry scores a major PR coup for being proactive. 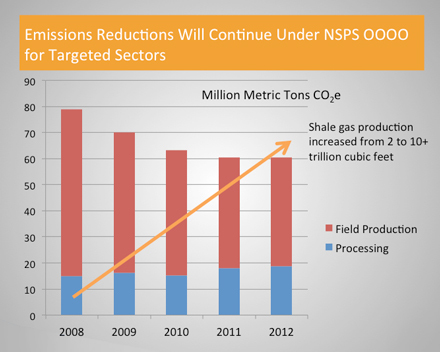 Best case, the oil and gas sector avoids some unnecessary regulation – and potentially higher regulatory costs – and exercises more control over how methane emission reductions take place. As the American oil and gas sector prepares to be competitive at $50 (or less) oil, it could do worse than try something new. NextUSA upgrades oil by rail regulations, why not Canada? Notley demand for pipeline a spat in the making or political theatre?